Reuters recently reported a hacking campaign focused on a wide range of targets across the globe. In the days leading to the Reuters publication, Microsoft researchers were closely tracking the same campaign. Our sensors revealed that the campaign primarily targeted public sector institutions and non-governmental organizations like think tanks and research centers, but also included educational institutions and private-sector corporations in the oil and gas, chemical, and hospitality industries. Microsoft customers using the complete Microsoft Threat Protection solution were protected from the attack. Behavior-based protections in multiple Microsoft Threat Protection components blocked malicious activities and exposed the attack at its early stages. Office 365 Advanced Threat Protection caught the malicious URLs used in emails, driving the blocking of said emails, including first-seen samples. Meanwhile, numerous alerts in Windows Defender Advanced Threat Protection exposed the attacker techniques across the attack chain. 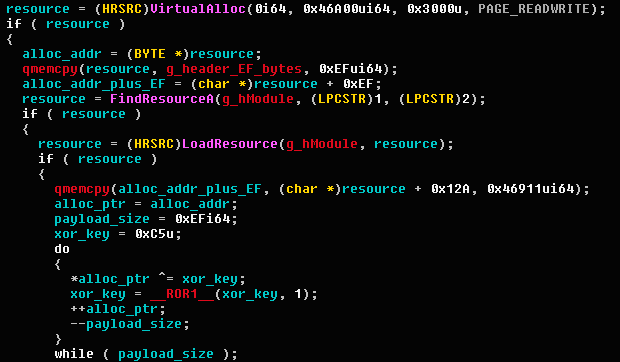 Third-party security researchers have attributed the attack to a threat actor named APT29 or CozyBear, which largely overlaps with the activity group that Microsoft calls YTTRIUM. While our fellow analysts make a compelling case, Microsoft does not yet believe that enough evidence exists to attribute this campaign to YTTRIUM. Regardless, due to the nature of the victims, and because the campaign features characteristics of previously observed nation-state attacks, Microsoft took the step of notifying thousands of individual recipients in hundreds of targeted organizations. As part of the Defending Democracy Program, Microsoft encourages eligible organizations to participate in Microsoft AccountGuard, a service designed to help these highly targeted customers protect themselves from cybersecurity threats. The aggressive campaign began early in the morning of Wednesday, November 14. The targeting appeared to focus on organizations that are involved with policy formulation and politics or have some influence in that area. 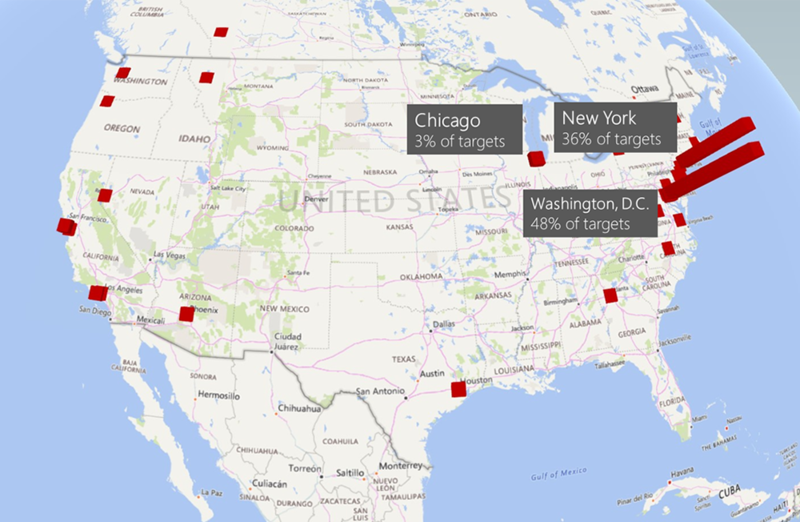 Although targets are distributed across the globe, majority are located in the United States, particularly in and around Washington, D.C. Other targets are in Europe, Hong Kong, India, and Canada. The spear-phishing emails mimicked sharing notifications from OneDrive and, as noted by Reuters, impersonated the identity of individuals working at the United States Department of State. If recipients clicked a link on the spear-phishing emails, they began an exploitation chain that resulted in the implantation of a DLL backdoor that gave the attackers remote access to the recipients machines. The spear-phishing emails used in this attack resemble file-sharing notifications from OneDrive. When users click the link, they are served a ZIP archive containing a malicious LNK file. All files in a given attack have the same file name, for example, ds7002.pdf, ds7002.zip, and ds7002.lnk. The LNK file represents the first stage of the attack. It executes an obfuscated PowerShell command that extracts a base64-encoded payload from within the LNK file itself, starting at offset 0x5e2be and extending 16,632 bytes. The first-stage DLL, cyzfc.dat, is created by the PowerShell script in the path %AppData%\Local\cyzfc.dat. It is a 64-bit DLL that exports one function: PointFunctionCall. Concatenate the header with the resource, starting at byte 0x12A. 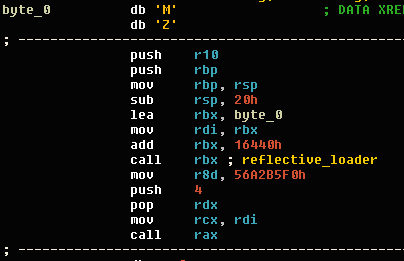 De-XOR the second-stage payload with a rolling XOR (ROR1), starting from key 0xC5. CobaltStrike is a feature-rich penetration testing tool that provides remote attackers with a wide range of capabilities, including escalating privileges, capturing user input, executing arbitrary commands through PowerShell or WMI, performing reconnaissance, communicating with C&C servers over various protocols, and downloading and installing additional malware. Microsoft Threat Protection is a comprehensive solution for enterprise networks, protecting identities, endpoints, user data, cloud apps, and infrastructure. By integrating Microsoft services, Microsoft Threat Protection facilitates signal sharing and threat remediation across services. In this attack, Office 365 Advanced Threat Protection and Windows Defender Advanced Threat Protection quickly mitigated the threat at the onset through durable behavioral protections. Office 365 ATP has enhanced phishing protection and coverage against new threats and polymorphic variants. 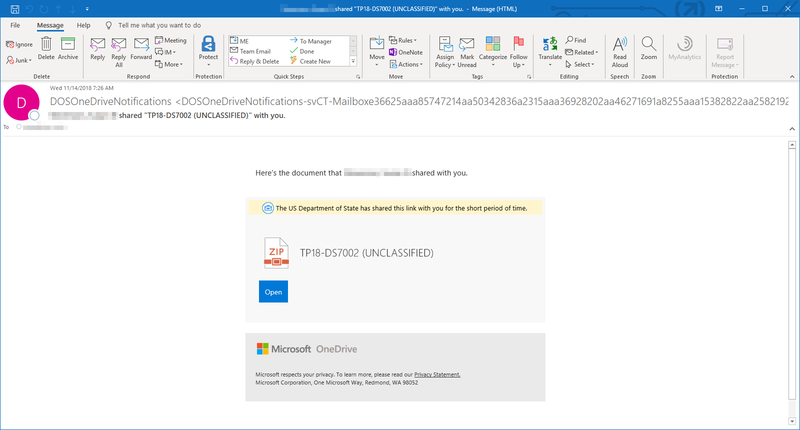 Detonation systems in Office 365 ATP caught behavioral markers in links in the emails, allowing us to successfully block campaign emailsincluding first-seen samplesand protect targeted customers. Three existing behavioral-based detection algorithms quickly determined that the URLs were malicious. In addition, Office 365 ATP uses security signals from Windows Defender ATP, which had a durable behavior-based antivirus detection (Behavior:Win32/Atosev.gen!A) for the second-stage malware.If you are not already secured against advanced cyberthreat campaigns via email, begin a free Office 365 E5 trial today. Safe Links protection in Office 365 ATP protects customers from attacks like this by analyzing unknown URLs when customers try to open them. Zero-hour Auto Purge (ZAP) actively removes emails post-delivery after they have been verified as maliciousthis is often critical in stopping attacks that weaponize embedded URLs after the emails are sent. All of these protections and signals on the attack entry point are shared with the rest of the Microsoft Threat Protection components. Windows Defender ATP customers would see alerts related to the detection of the malicious emails by Office 365 ATP, as well the behavior-based antivirus detection. Through Windows Defender Security Center, security operations teams could investigate these alerts and pivot to machines, users, and the new Incidents view to trace the attack end-to-end. Automated investigation and response capabilities, threat analytics, as well as advanced hunting and new custom detections, empower security operations teams to defend their networks from this attack.To test how Windows Defender ATP can help your organization detect, investigate, and respond to advanced attacks, sign up for a free Windows Defender ATP trial. | where RemoteUrl == "pandorasong.com"
"-noni -ep bypass $zk=' JHB0Z3Q9MHgwMDA1ZTJiZTskdmNxPTB4MDAwNjIzYjY7JHRiPSJkczcwMDIubG5rIjtpZiAoLW5vdChUZXN0LVBhdGggJHRiKSl7JG9lPUdldC1DaGlsZEl0"
The provided queries check events from the past ten days. Change EventTime to focus on a different period. The post Analysis of cyberattack on U.S. think tanks, non-profits, public sector by unidentified attackers appeared first on Microsoft Secure.